Lorna Simpson, Unanswerable (detail), 2018. Found photograph and collage on paper. 40 framed photo collages. 670.5 x 304.8 cm / 264 x 120 in. approx. Photo: James Wang. © Lorna Simpson. Courtesy the artist and Hauser & Wirth. Installation view, ‘Lorna Simpson. Unanswerable’, Hauser & Wirth London, 2018 Photo: Alex Delfanne. © Lorna Simpson. Courtesy the artist and Hauser & Wirth. 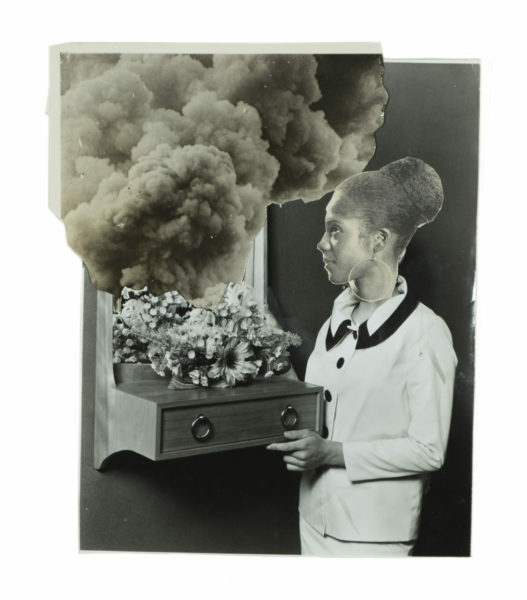 Lorna Simpson, Montage, 2018. Ink and acrylic on 5 gessoed fiberglass panels. 170.2 x 635 x 3.5 cm / 67 x 250 x 1 3/8 in. Photo: James Wang. © Lorna Simpson. Courtesy the artist and Hauser & Wirth. Portrait of Lorna Simpson. Photo: James Wang. Courtesy the artist and Hauser & Wirth. Lorna Simpson came to prominence in the 1980s through her innovative approach to the medium of photography, juxtaposing text and image to raise questions about notions of representation, identity, gender and race. These themes are still at the core of her inaugural exhibition Unanswerable at Hauser & Wirth, who have been representing the African-American artist since last April. For the past few years found photography has been the source of Simpson’s work. She uses images from the Associated Press as well as from her collection of vintage Ebony and Jet magazines that focused on US-American culture, life-style and politics from an African-American perspective. 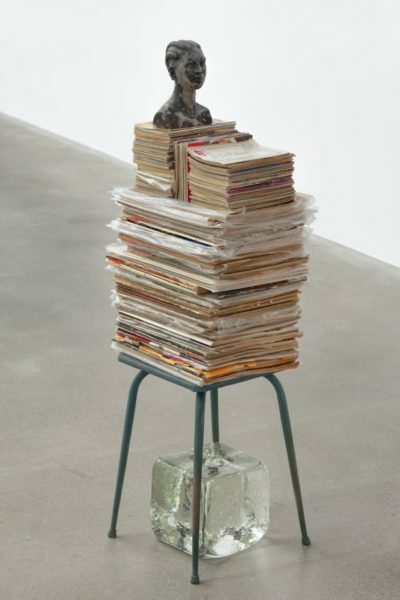 She re-appropriates the found images in her paintings and sculptural work, as well as in her collages. The photographic material has a personal and wider cultural importance for the artist who describes how the Ebony and Jet magazines “informed my sense of thinking about being black in America and are both a reminder of my childhood and a lens through which to see the past 50 years of history”. The installation Unanswerable that is displayed on a large wall near the entrance of the gallery consists of 40 individual photo collages that the artist created from found archive photography. Images of mainly black female protagonists are spliced with architectural features, animals and natural elements, creating scenarios that captivate the viewers’ gaze because of their unexpected and sometimes absurd settings. 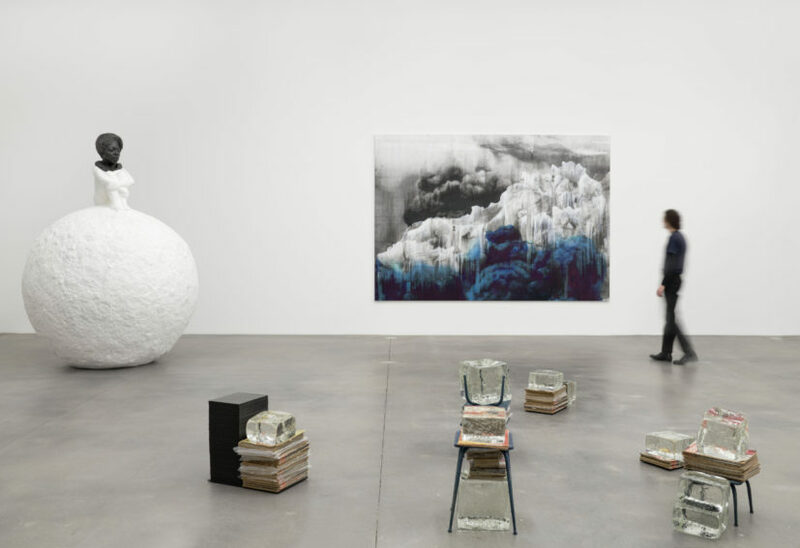 The natural element of ice appears throughout the show; in her new sculptural works as glistening ice-blocks made of glass and in one instance as an oversized snowball made of plaster on top of which a small female figure perches. Ice indicates notions of freezing and endurance to the artist and recalls the expression to be ‘on ice’ or in prison. It also relates, as we learn from the press release, to Eldridge Cleaver’s (1935 – 1998) book Soul on Ice, 1968, written while the renowned activist was imprisoned in Folsom State Prison. Through reconfiguring existing images in different artistic mediums Simpson’s bricolages explore culture and life in the United States today. Her poetic works don’t offer definitive questions and answers but rather subtle hints and suggestions to wider issues in society. In a decidedly non-didactic manner her multi-disciplinary work encourages us to develop our own interpretations and narratives. 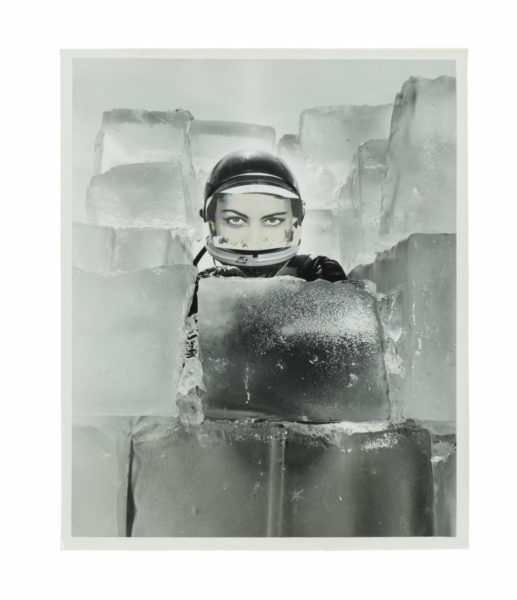 To me, the way the artist creates new narratives with historical source-material in combination with her focus on the natural element of ice, suggests the idea of a standstill or of ‘being frozen’ in the past. I am currently reading Guardian journalist Afua Hirsch’s recently published book Brit(ish): On Race, Identity and Belonging, 2018 and from Hirsch’s point of view of growing up as a Black woman in the UK, the preconceptions around race, identity or gender Lorna Simpson started to address over 30 years ago still prevail in the world we are living in now. 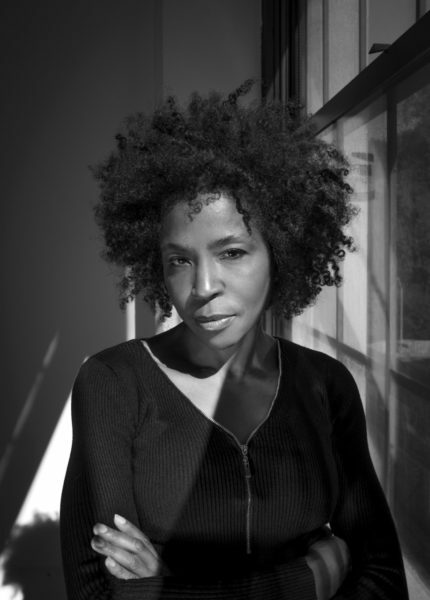 Lorna Simpson was born in Brooklyn, where she continues to live and work. She received a BFA in photography from the School of Visual Arts, New York, and an MFA in visual arts from the University of California, San Diego. Over a career that spans three decades, Simpson has participated in distinguished international exhibitions such as the Hugo Boss Prize at the Guggenheim Museum, New York NY, Documenta 8 and 11, Kassel, Germany, and the 44th and 56th Venice Biennales. Simpson has exhibited extensively, both nationally and internationally, recent exhibitions include the Atrium Wall project, MCA 50th Anniversary, Museum of Contemporary Art Chicago IL (2017); ‘Lorna Simpson: Hypothetical?’, Fisher Landau Center for Art, Long Island City NY (2017) and ‘Focus: Lorna Simpson’, at Modern Art Museum of Fort Worth, Fort Worth TX (2016). A survey retrospective, ‘Lorna Simpson’ opened at the Jeu de Paume, Paris, France (2013) before travelling to Haus der Kunst, Munich, Germany (2013); Baltic Centre for Contemporary Art, Gateshead, UK (2014) and the Addison Gallery of American Art, Andover MA (2014). Other key exhibitions include ‘Lorna Simpson: Gathered’, Brooklyn Museum, Brooklyn NY (2011); ‘Recollection: Lorna Simpson’, Walker Art Center, Minneapolis MN (2010) and ‘Lorna Simpson: Duet’, The Studio Museum in Harlem, New York NY (2007). 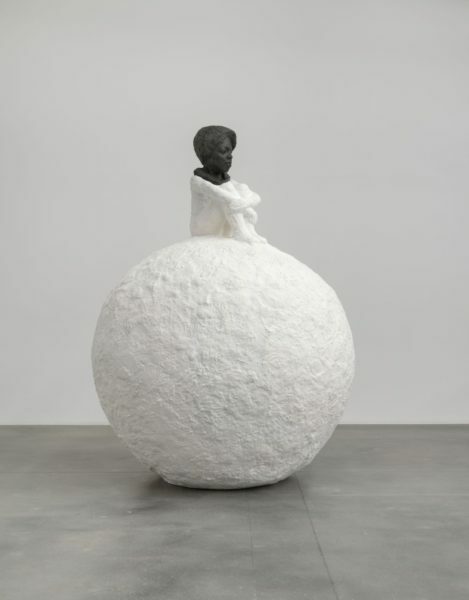 Her first mid-career survey, ‘Lorna Simpson’ was exhibited at Museum of Contemporary Art, Los Angeles CA (2006); Miami Art Museum, Miami FL (2006); The Whitney Museum of American Art, New York NY (2006) and The Gibbes Museum, Charleston SC (2006).